Those of you who know the My 52 Weeks of Worship Story know that the first 52 weeks of this now five year journey began after a year of loss – my father passed away, my grandmother died, and a relationship ended. My father, like me, enjoyed reading and learning about spirituality, faith, and truth from any source, although he worshiped God within the Christian tradition, as I do. When he passed away, I inherited many of his books, and the new book club pick is one of those books. 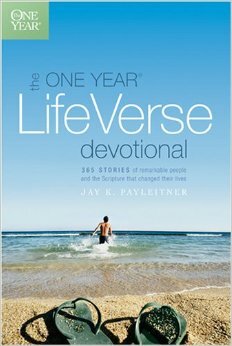 The book is called “The One Year Life Verse Devotional”, by Jay K. Payleitner. I started reading it at the beginning of 2015, so it will be this year’s pick. Already I have fallen in love with this book. It is the central part of my morning quiet time, and is allowing me to delve deeper into my own spiritual practice. The book is described as “365 stories of remarkable people and the Scripture that changed their life.” Every day, I get to meet a new “remarkable person,” read their story, and the Scripture that served as a turning point in their life. That Scripture often becomes they return to in times of trouble. This year, I am meditating a great deal on resilience, and what makes one resilient. I am revisiting the lessons that I learned on a year long journey that started over five years ago. And I am starting every day reading a page from this book. It is blessing me. Let me know if it blesses you as well.